Government officials claim they’re ultra-precise killing machines that never, ever miss their targets. Outside groups say they’re covered in children’s blood. The fact is no one has a clue exactly how many militants and how many innocents have been slain in the U.S. drone war that spans from Pakistan to Somalia. Remember that before you start your next Twitter feud about the drone war. Neither the American government nor the independent agencies have the consistent presence on the ground needed to put together true assessments of the damage drone strikes do. Most of the evidence is third-hand, whispered from a local soldier to a far-off reporter. The death toll claims, which vary wildly, are all educated guesswork. 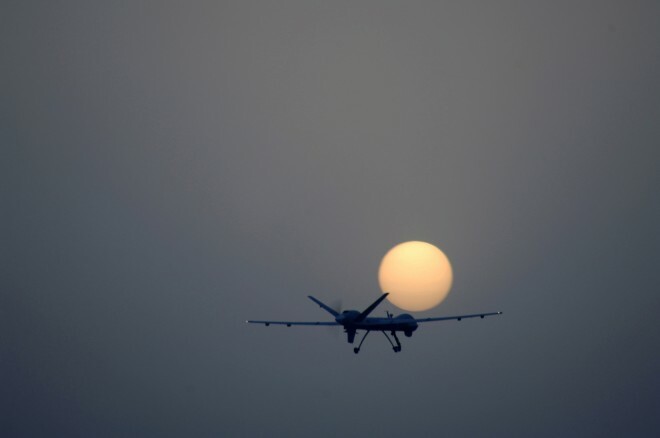 It’s one of many conclusions in a new report on the covert, robotic air war that doesn’t fit neatly into the dominant narratives about the drone campaign, pro or con. (The report is due to publish at midnight GMT on Sunday.) Using interviews with dozens of people in northwest Pakistan — one of the epicenters of the unmanned air assaults — The Center for Civilians in Conflict and Columbia Law School’s human rights clinic have crafted a nuanced view of the civilian impact of this most controversial component of the Obama administration’s counterterror efforts. Table your preconceived notions about the drone war before you read — starting with the notions about who the drones are actually taking out. In May, an administration official told The New York Times that civilian casualties from the Pakistan drone war were in the “single digits.” Perhaps that official only meant for one year. Meanwhile, the Bureau of Investigative Journalism estimates the minimum civilian death toll to be 447 during the campaign. One of the many costs of secret wars is that ”nobody knows how many civilians have been killed by covert drone strikes. Nobody — that means the Obama Administration, the Pakistan government, and the media,” emails Sarah Holewinski, the executive director of the Center for Civilians in Conflict. The CIA relies on local informants to help guide the strikes; that sows suspicion in these communities, pitting one neighbor against the next. The fear and backbiting sometimes causes villages to largely empty out — which creates its own cascade of problems. “Drone-related displacement disrupts long-term stability by decreasing the capacity of local people to respond through civil society initiatives that foster stability, democracy and moderation and increase displaced people’s vulnerability to insurgent recruitment,” Lisa Schirch of 3P Human Security explains in the report. The covert nature of the drone campaign produces strange imbalances in the ways civilians are treated from warzone to warzone. If an American aircraft drops a bomb on your house in Afghanistan, U.S. officers will usually offer some kind of financial compensation for your loss. It may not be much, but at least it’s a recognition of the harm done. If an American aircraft drops a bomb on your house in neighboring Pakistan, however, you get nothing. There are no American officers in the vicinity — at least not officially. There’s no one to provide that financial or psychological recompense. Sometimes, innocents caught in the robotic crossfire get punished a second time. The drones are believed to be beyond-precise, which naturally leads to the conclusion that whoever has been targeted must be bad. “Victims face the double burden of dealing with the physical attack and also clearing their name,” according to the report. Meanwhile, the rest of us take our best guesses about the toll of these shadow wars. And that’s its own problem. The drone strikes, the centerpiece of the Obama administration’s counterterrorism efforts, inspire heated opinions in the United States. That’s as it should be: Wars ought to be debated. But by keeping the drone war, and especially its consequences, wrapped in secrecy, the Obama administration and its foreign enablers shut off the basis for that debate. Second-order questions (Would other tactics be more or less brutal? Do the drones breed more radicalization than dead radicals?) that are necessary to intelligently assess the wisdom of the drone war can’t be answered. And so various factions yell at each other, each convinced they’ve grasped the truth of a war that has practically none to offer.